Who said work couldn’t be fun? While leading our guided walks we often get asked about what maintenance we have to do on the leat. The vegetation on the leat sides have naturally grown to be an annual job. To stop the trailing brambles and ferns blocking the flow of organic debris to continue its way down the leat to the screener, we must trim the edges back once during the summer and cut them back properly later in the year. 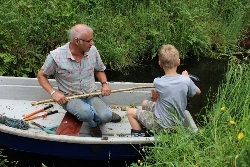 The picture shows how we use our little row boat to travel up the leat with our outboard electric motor and trim the far bank of the leat sides with hand tools. 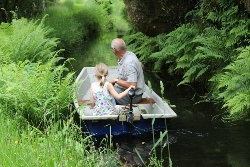 It becomes a great family affair with the grandchildren helping while they learn how to control the boat – needless to say Grampy did end up in the foliage once or twice!